It’s easy to take your good vision for granted, but if something should go wrong, it could change your entire life. If you have not visited an eye doctor in Chicago recently, it’s time to make an appointment. 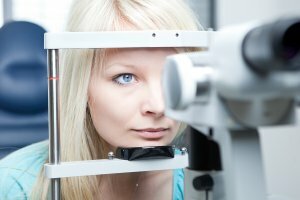 Your eye doctor can spot potential vision problems before you even notice that something is wrong. Cataracts are a common condition that tend to affect older adults, and can lead to blurry, tinted vision. If your cataracts become severe, you may need to consult a custom cataract surgeon in order to restore your vision. Read on to learn about the risk factors for cataracts. Aging is a part of life, but it can bring changes in your health that you may not be prepared for. Cataracts tend to affect people over the age of 60, though there are people who develop cataracts during middle age. Approximately half of adults over the age of 75 have cataracts, and may need eye surgery to correct them. Normal proteins inside your eye’s lens can clump together as time goes on, which is what creates the cloudy effect in your vision. In general, women tend to have a higher risk of developing cataracts than men. Like many medical conditions, cataracts can be hereditary, so it’s a good idea to know your family history and find out if any of your relatives experienced them. Individuals of certain ethnicities may also be at a higher risk for cataracts, specifically African Americans and Hispanic Americans. High blood sugar levels can contribute to the development of cataracts, which is one of the reasons why people with diabetes have a higher risk of developing them. In addition, individuals with diabetes are more likely to develop cataracts when they are younger than those without the disease. People with autoimmune diseases such as rheumatoid arthritis, lupus, and multiple sclerosis may also be at a higher risk of developing cataracts because of steroid medications they may need to take frequently. Be sure to tell your eye doctor about your complete medical history during your next eye exam.